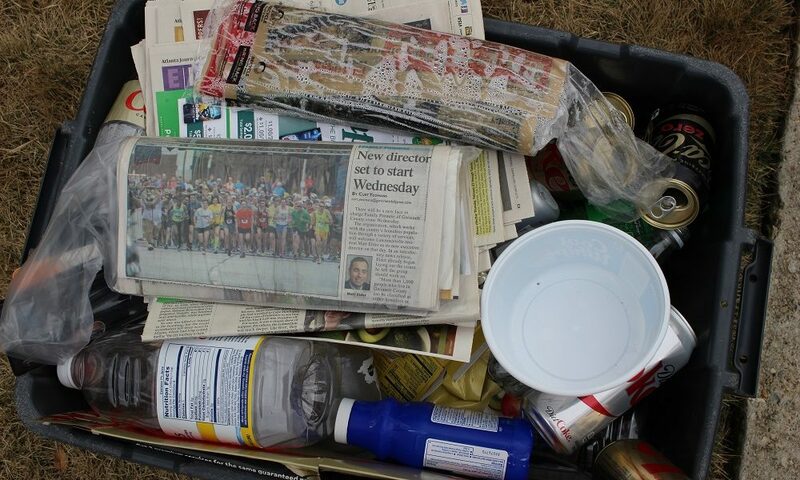 Contamination — when items that can’t be recycled curbside are put into curbside bins — is one of the biggest challenges facing recycling today. 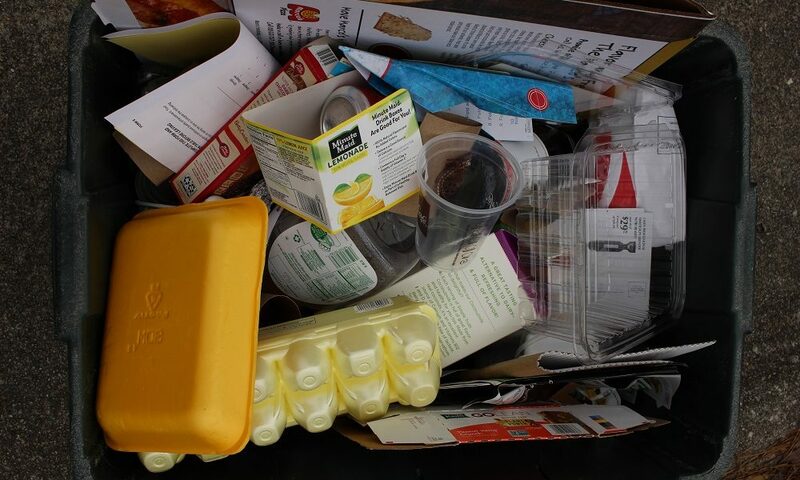 The best thing we can do for recycling is to keep our household recycling streams clean and free of contaminants. Go by the mantra “when in doubt, keep it out!” Recycling right is good for the economy, the environment, and our community. That said, it can take a while to learn what’s recyclable curbside and what’s not. Can you recognize contamination when you see it? 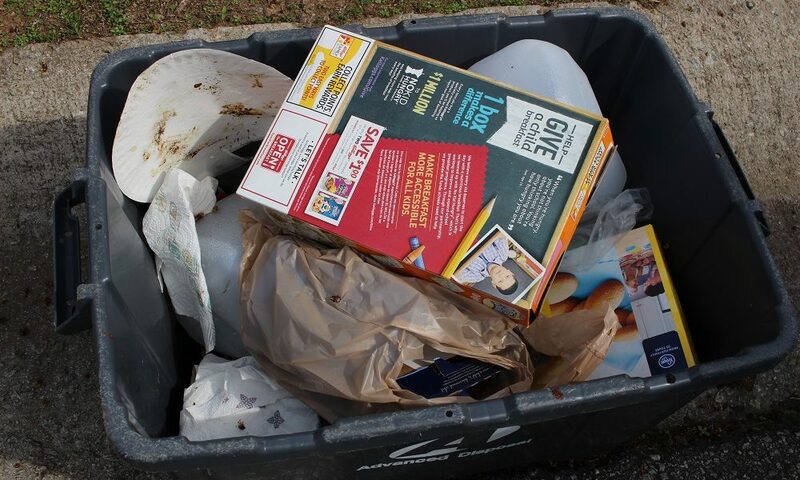 Check out these photos of recycling bins and click the button below each photo to learn what in that bin can’t be recycled curbside in Gwinnett County. 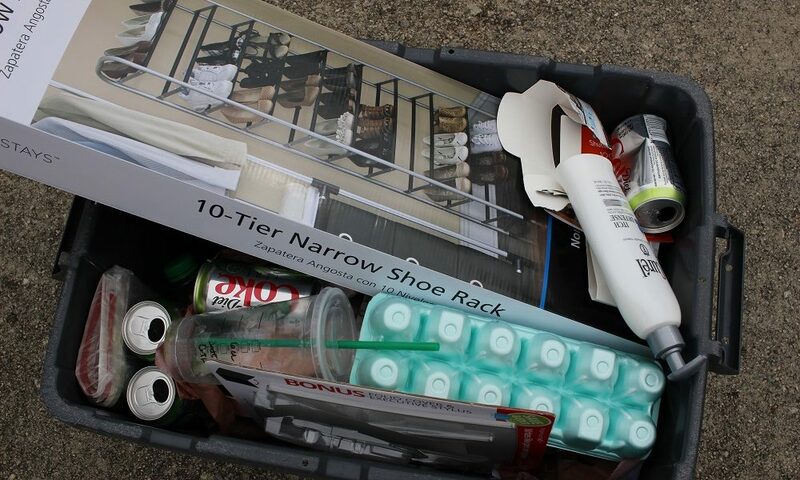 Hint: To keep you on your toes, one or more bins might not have any contamination! See if you can guess which ones. Plastic bags should never go in a curbside bin, whether they’re empty or full of other recycling. 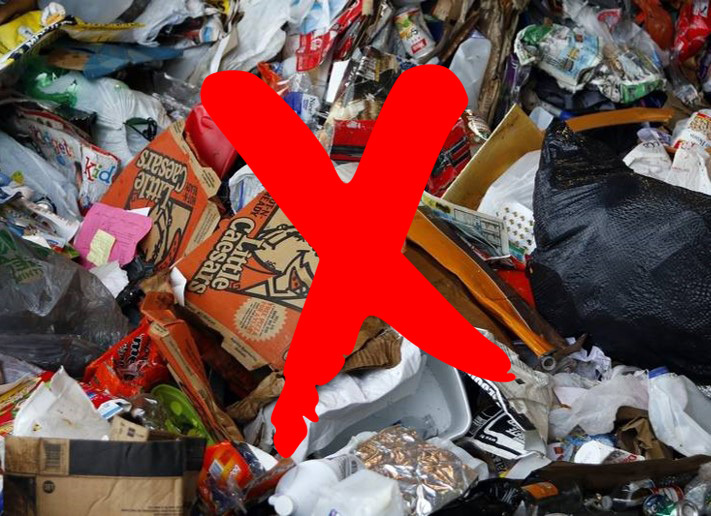 In fact, bagging your recyclables is likely to get them thrown away, since workers at the plant may not be able to cut open tied bags and sort through what’s inside. Take bags to plastic bag recycling bins at stores and always leave curbside recyclables loose. Plastic newspaper sleeves count as plastic bags, too! Newspapers must be removed from their sleeves before they can be recycled. 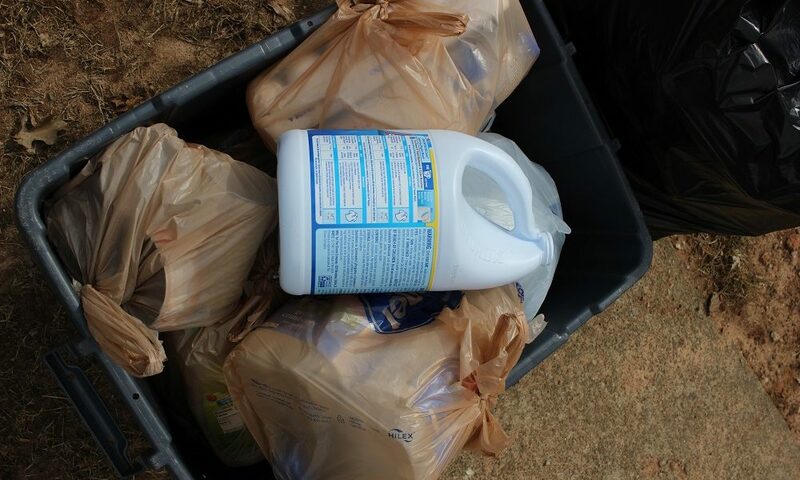 Clean and dry plastic sleeves can be put in plastic bag recycling bins at stores. Nothing wrong here! 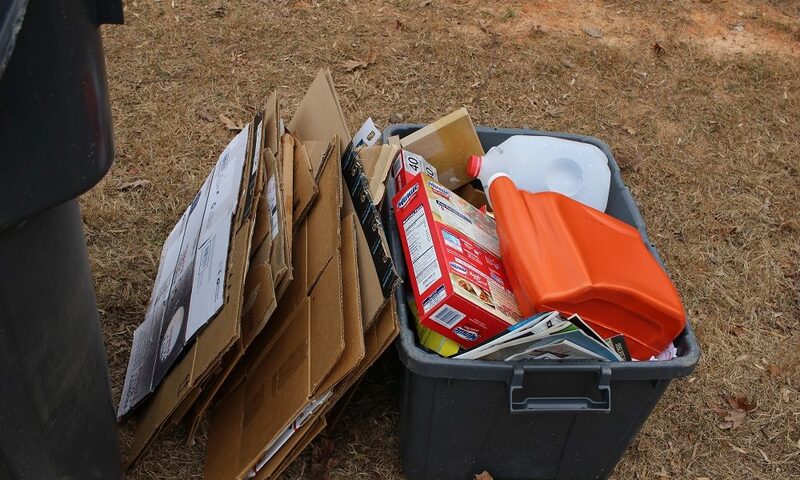 With clean cardboard, paper, and plastic jugs, this recycling bin gets an A+. Styrofoam can’t be recycled curbside. 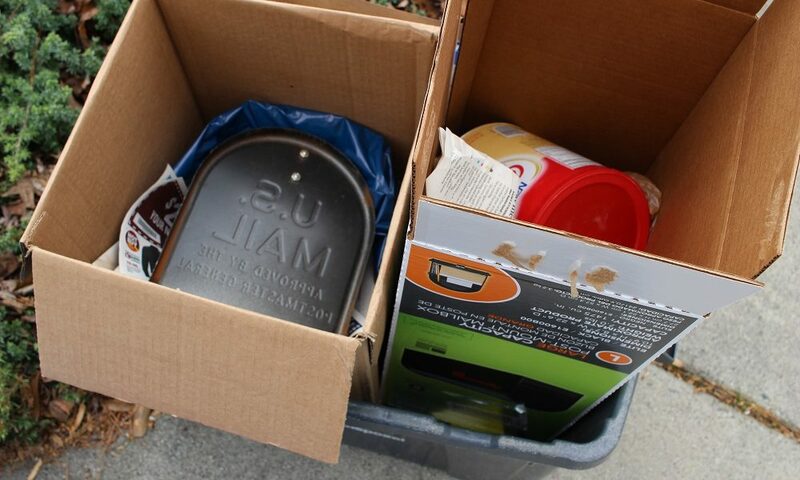 Instead, take Styrofoam egg cartons and trays to Publix grocery stores for recycling. Glass is no longer accepted in curbside recycling. To ensure that your glass beverage containers and jars are recycled, take them to a location where glass is accepted in a bin separate from other recyclables. Also, no plastic bags curbside! Scrap metal, such as this mailbox door, can’t be processed in curbside recycling. Bonus points if you noticed the plastic bag underneath the mailbox piece! Did you notice all four problems here? The Styrofoam egg tray can’t be recycled curbside. The Starbucks cup still has liquid in it, which will contaminate other recyclables, such as clean paper, when it is compacted in the recycling truck. And the lotion dispenser pump is unlikely to be recycled curbside — mailing it for free to a company like TerraCycle is more likely to ensure that it’s recycled. Plus, don’t forget to keep plastic bags like the sleeve in the lower left out of the bin! 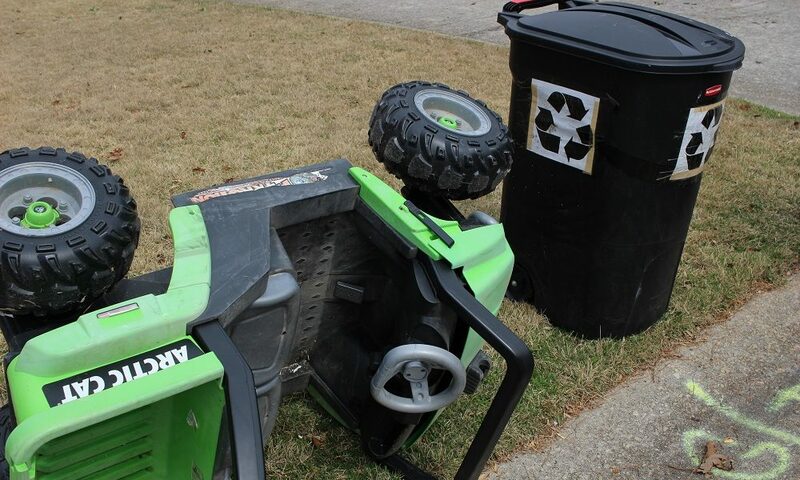 Toys are not recyclable in Gwinnett County. Donate them, or throw them away if they’ve reached the end of their life. Paper towels are never recyclable, and this paper plate is too dirty to be recycled into new paper. The plastic bag can’t be recycled curbside. Anything greasy, such as this paper bag, belongs in the trash, not in recycling. 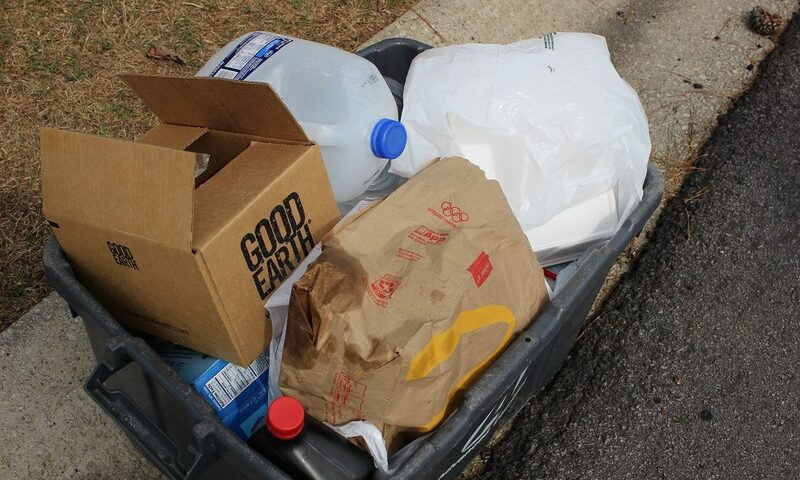 The plastic bag (and the Styrofoam takeout container inside it) can’t be recycled curbside either. How did you do? 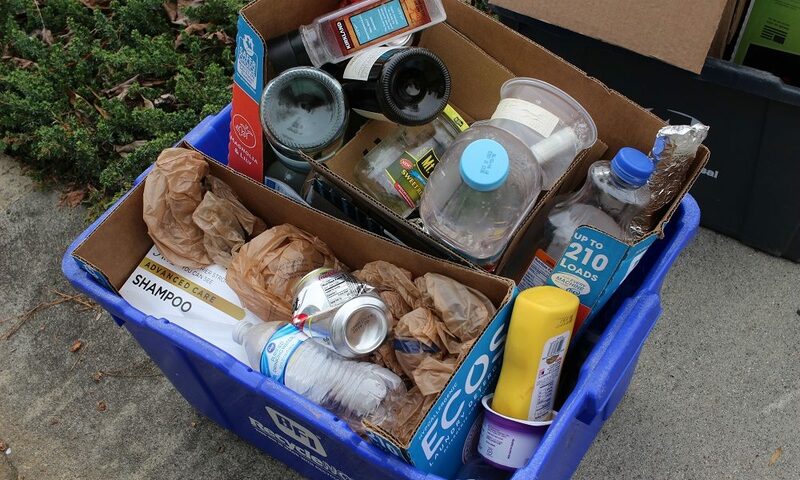 Were any of the recycling mistakes ones that you’ve made before too? Don’t worry if you got some wrong or haven’t recycled perfectly in the past. Starting today, see if you can make a couple of small changes each week to recycle more of the good stuff and keep the wrong stuff out. It’ll go a long way! My team and I are doing recycling research in Florida. I came across this post and loved your quiz. This is such a creative idea to assess knowledge. We are interested in using your images and wanted to ask you if we could include it in a survey that we intend to distribute to Florida residents. If you would like more information, please do not hesitate to ask. We certainly would credit you as the owner of the images. In any regard, feel free to not grant us permission. We want to be respectful of your photos and work! Thanks for getting in touch. Yes, you may use the images! Laura, thank you for your efforts in Gwinnett and for this excellent and informative post. Our community needs more of this! I consider myself a pretty serious recycling enthusiast so I can’t help but point out that plastic bag in #7. It’s the 4th problem! Great catch, Jacob! Updating that now.